Background: In September 2017 the Pittsburgh chapter of the International Game Developer's Association hosted a one day board game jam which I attended with Ketul, Iris, Justin, and Vasant. The theme owas "Relationships" so we decided to make a board game about the relationship between super heroes and the cities they save. The game was played with four cooperative players each controlling an individual hero playing against a single "monster controller" who played the monsters and villains attacking the city. The Hero players win if they defeated a supervillian monster, and the monster controller wins if the cities health reaches 0. Monsters will damage the city if they survive the round of hero play. Character Design: For this project I was tasked with designing the heroes available for play. Each hero has two attributes that are modified based on the action card selected for their turn. The base movement and strength values are listed on the character card along with the hero name. Each character's 6 ability cards may add a special ability, and attribute modifications for the turn. To decide on these values as well as the different abilities I kept the following principles in mind. I wanted the to make sure each character was balanced so that none overshadows the others, but all feel unique and distinct from each other. Each player should also have a variety of choices for ability cards on their turn that feel different, and each player should have options for teamwork. In many superhero movies you see the hero's inadvertently destroy parts of the city they are trying to protect. To represent this in game, as well as balance more powerful abilities against weaker ones, many abilities cause city damage in addition to monster damage. 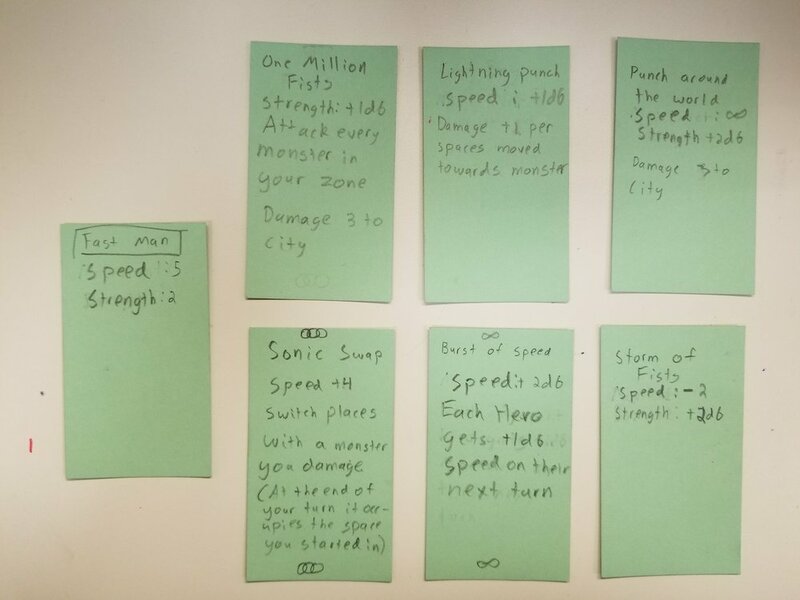 This means that with a relatively simple system I could balance a range of power levels for abilities across the characters. To reinforce the superhero theme, I used the names of the abilities to add character to each of the heroes. Were there any abilities you never used, and if so why? Which ability did you use the most and why? How did you feel about your character? If a player never used an ability then I would improve it's statistics or change the structure to make it more useful. If a player used a single ability for most of the game, then I changed it to be less powerful, or useful in less situations. And if a player felt like their character was in general too powerful or weak compared to the others then I adjusted their main stat card. For example Metal Steve's base Strength was originally 4, but most players felt that due to his lack of mobility with only 2 speed and no range that he was too weak. This led to an adjustment to 7 strength, as well as the inclusion of teamwork based movement abilities for each character (helicopter extraction, teleport, hero heave, and sonic swap) to help give options to move him around. Originally Lady of Death's "Parkour with Knives" ability added 2 six sided dice worth of strength, so one player used it every round of the game.